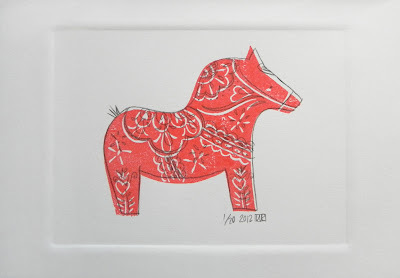 Have been wanting to make a Dala horse for ages, the wee Swedish primitive horse carvings that originated as a winter pastime, children's toy and then became useful barter during times of hardship. It is wonderful how the forms fashioned by hand either out of clay or wood from many different cultures have a universal sensibility. My Dear Dala is a single colour print, carved from a block of SPEEDY CARVE same as OWLY and PIXIE. Also done in the same colour way - red, blue, teal and yellow. Plus it has my secret detail overlay. These little guys would look lovely in a child's room as well as with a collection of prints in your kitchen or living room. He will be available at the HOUSE & GARDEN Show from this Friday as well as iKHAYA. If you would like one and live somewhere other than Durban, I can pop one in the post for you easy peasy!